Google uses a complex calculation to rank websites according to their ability to influence power. It is shown that the website that is shared is more will taken as valuable website and Google will be rank that site up in rankings. The fact is where the website is shared more often. Twitter is one of the social sites where you can use your websites to share. 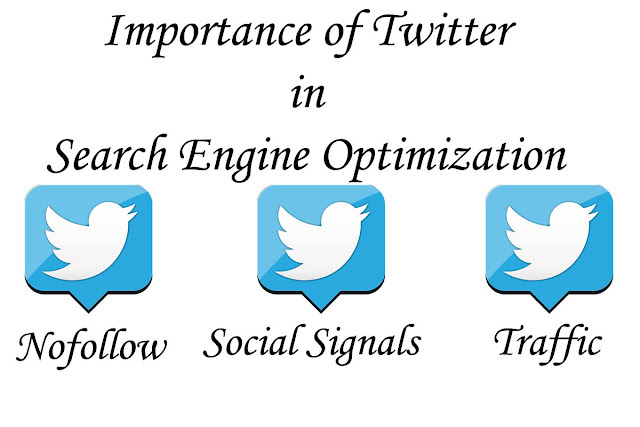 Google takes it as positive remark for your website if it is shared very often on twitter. It will certainly bring more traffic to your website. Importance of Nofollow Tag: Relation Nofollow tag was made for webmasters to convey to Google that it should ignore the link having relation nofollow. No follow tag can be used for the links which are not trustworthy according to the webmasters and it is also used for creating backlinks with low quality content for a particular website. It simply tells Google to pass through the link and webmasters don’t trust this website. What it does, it just don’t pass page rank and link juice to the linked page from the referring website. Then webmasters try to create lots of dofollow backlinks to get high rankings. It worked earlier but then Google updated its algorithm and penalized the websites which are found under creating backlinks with this strategy to rank up in search results. Twitter backlinks are nofollow so you don’t worry about getting penalized by Google for creating so many backlinks. Twitter backlinks are useful although they are no follow. Nofollow backlinks are also must for a website to create a healthy link building strategy. Importance of Social Signals: Google didn’t expose ever that how its algorithm works to rank websites yet there are many professionals who suppose that social sites like Twitter has the extra significant value in Google’s eye. Google itself conveyed that it will count many social profile links in ranking the websites and also the shared links from some social sites. Social sites are becoming the head in Search Engine Optimization now. So there would be every chance in the future that if you have a strong social profile then you could be ranked above others. Generate Traffic: The best possibility that we post a link on twitter tweet is to get lots of traffic to it. Whenever one posts links with impressive content and information then it will be shared more than anything else. Your supporters will distribute your link with their followers. It the chain starts working then there is every chance that your content would go viral and it will generate loads of visits to your web links. Best Practices to Follow: Every social site will give more benefits when we create good and healthy relation with our groups and followers. When we try to force to issue by posting only links that are not worthy for our followers, they will immediately unfollow us. What we should share is depended on many things. We should take care about the niche of our group or followers and post links about the best information that can help them. Develop trust and loyalty with your followers as twitter followers are the one who are going to get you that traffic which is must for your website to attain value on the web. Twitter is a good source of traffic and that's what I think all the time. I am not concerned about backlinks. It can also deliver some backlinks to your website. But you are right that it is one of the biggest sources of traffic.